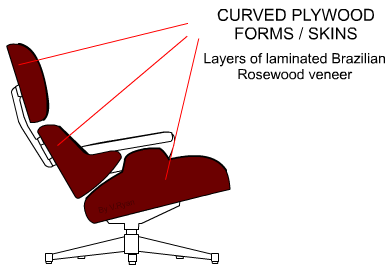 Laminated wood is suitable for the head rest, back rest and seat of the Eames chair. When thin layers of veneer are glued together, forming one part, they are called laminates. Complex shapes can be achieved with one piece of laminated material. The natural wood gives a quality finish. The basic stages of manufacturing the laminated forms are describe below. Thin laminated veneers are used manufacture the rests and seat of the chair. The thin layers of veneer are steam treated first. They are placed in steam chamber. Steam is introduced at one end and excess steam / pressure escapes at the opposite end. Condensed steam (water) drains away. As the steam flows from one end of the tube to the other end, moisture is absorbed by the veneer. After a period of time, the veneers are removed. They are now pliable and it is possible to bend them to the required shape, using a former. The layers of veneer are clamped in the former and left for several hours, . This allows them to cool. When the clamps are removed, the veneers remain in the shape of the former. They are then glued permanently together, using PVA, woodworkers resin or cascamite and clamped in the former until the glue sets.